Review: 'The Color Purple' is a series of letters written by from one sister to another over a 20 year time period. The principle voice is Celie, who is raped by her supposed father as a young teenager and bears two children by him. He takes the children away from her and then marries her off to a cold, abusive man. 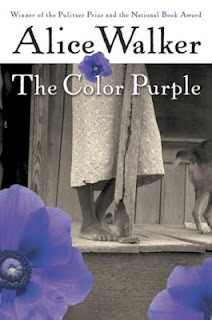 Celie's husband eventually moves his mistress, Shug Avery into their house and Shug helps Celie discovers what it means to have self worth, to love and to be loved. Meanwhile, Celie's sister travels to Africa as a missionary with a couple happens to be raising Celie's children. Although the sister's are separated for years and their letters do not reach each other (for the majority of the novel), we learn about both of their lives. This is a layered book and reading about Celie's life is harrowing. This book is not for the faint of heart. There is a lot of abuse (sexual, physical and emotional) but while the topics are heavy, watching Celie grow and find herself is liberating. This book would have been an A except for the sections written by her sister. They were so dry and boring it was difficult to stay awake. Luckily they were a small part of the book, but it was still annoying. A final criticism was the ending felt a little too "Hollywood."